Texas Gothic was one of my favorite books a few summers ago, and once I realized that it was going to be a series, I got really excited. Even the small glimpse that we got in the first book of the extended Goodnight clan was awesome. And then I read that book 2 was going to focus on Goodnight cousin Daisy, teen psychic who pops up to help solve the mystery of the McCulloch Ranch. Yes good. (Also good? 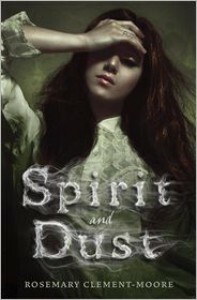 You don’t need to read Texas Gothic to set up the plot of Spirit & Dust. Sure, the first book introduces you to the wild and wacky Goodnight clan, but Spirit & Dust does just as good of a job establishing this fact with Daisy as well. I don’t know which one I’d recommend to start with since they’re both equally good on that level, but I would say go for whichever you think is more interesting to start with. )The one thing Clement-Moore does extremely well with her characters is that even though they share a lot of traits across the board (mainly the ability to snark), there’s still enough to differentiate from each character so that they don’t become carbon copies of each other. (Methinks that Daisy and Lisa from the Maggie Quinn series would get along fabulously.) This does feel a lot different from the other books of hers that I’ve read, not because of the tone, but because I did feel something different with all of the characters, plus a much grander plot to work with in here.So, our Heroine! For the few chapters she popped up in Texas Gothic, I did actually like Daisy—she was a nice foil to the overly tense Amy and Phin being…Phin. To have her take the stage definitely sets up the kind of book here—Daisy is a way more dynamic and outspoken person than her cousins and I like that we get that upfront. I also like her morality and how she’s willing to do the right thing. (I loved that Daisy gets pissed off when she’s forced to make a triple vow for a job she’s already willing to do.) It’s not just the finding lost coed daughters of mob bosses, but her willingness to help stranded souls move on. Sure, Daisy’s going to milk a remnant for all the information they have on a current crime scene…but she’s also going to see if they’re happy where they are at the moment.Much like the intricacies of the Goodnights’ supernatural products and brand of witchery (and whatever the hell Phin does—please let the next book be about her), I liked that we get a clear explanation of what Daisy actually does and how it effects her physically and mentally. While there’s some points that feel like she’s just using her powers wily-nily, such as when she’s in the St. Louis museum, there’s at least consequences to when she’s finished and then MIGRAINE FROM HELL. I really liked that there’s even a clear explanation for not only how Daisy talks to the dead, but also that she makes it clear that it’s not just a person’s soul she’s talking to, but a piece of it. Hence the use of “remnant” over spirit; it’s what memories and experiences have tied a soul to a specific object/place, and that’s what Daisy utilizes. And I like that we get to see this used in several different fashions: the remnants who haunt places because they have objects tied to them there, the ones who’ve just died and even calling up other people’s memories to utilize a remnant. With that last one, using the photograph of Ivy Goodnight is fantastic, especially given Daisy’s hero-worshipping; but, how awesome was Daisy calling up the spirit of Sue the T.Rex in Chicago? C’mon, that was epic. Plus, I really liked how the remnants’ ability to observe from certain objects plays a major role in the plot—it feels like a throwaway detail at first, until the one big reveal. It’s small enough that it doesn’t need a lot of repeating, and we do get to see the use of the device in action before it becomes hugely plot important.The plot here is much more action-packed and grandiose than Clement-Moore’s other books, which is another detail that I really liked. There’s mob bosses, mummies, and an end-of-the-world cult that has the potential to demolish Chicago and then the world. (As an end-of-the-world cult does.) There a few twists that seem fairly obvious from the beginning—I called that Devlin Maguire would have been in on his daughter’s ‘kidnapping’ from the start; Alexis, I wasn’t so sure about until closer to the reveal. But it’s still a lot of fun to read and try to figure out the plot points as Daisy tries to unravel the mystery. I really liked Daisy’s rapport with both Agent Taylor and Carson. With Taylor, I liked that Daisy acknowledges that she really just has a puppy crush on him that’s never going to go anywhere, but that the two of them are able to tease each other on it. And do I think that Agent Taylor does care about Daisy—more like siblings, in a way. (If there’s more books about Daisy, I really want to see this relationship expanded on.) I did also really like Carson—I like his chemistry with Daisy, I think that they work well together, even when they’re both trying to outsmart each other (the scene where Carson admits he realized that Daisy stole a cell phone off him, that was adorable). My main problem with Carson—and this is an issue I’ve had crop up with all of Clement-Moore’s romantic heroes—is that I get what his motivations are…but I never get all of the reasons and backstory behind it. There’s enough here to explain why Carson does the things he does, but there’s a lot that’s not covered as well. Like when we find out that yes, Carson is a member of the Brotherhood of the Black Jackal, and the implications of why he joined are there. But we never get the full animosity between him and the other members, it’s just left as “Oh, well, Carson just feels like he made a mistake that he needs to atone for!” I don’t want a complete info-dump on Carson’s entire life and background, but I do want more exploration into his past, especially since there feels like there’s another story between him and some of the other lackeys.As I said above, Spirit & Dust is bigger and more involved than its predecessor or some of Rosemary Clement-Moore’s other books. The story, though, is solid (and actually wraps up pretty neatly, only leaving romantic entanglements to expand in future installments), the characters are completely engaging, and there’s just enough world-building to expand on what we got in book 1 and leaves enough wiggle room for future installments. As I said, it’s really hard for me to say which book you ought to read first in the Texas Gothic series, but if you want to start with Spirit & Dust, I would say that it’s a great book to kick off with. In the meantime, I will be awaiting the next adventure of the Goodnight clan.